The Greenville Drive will be sending a league-high eight players to the 2015 South Atlantic League All-Star Game at McCormick Field in Asheville, N.C. on June 23. 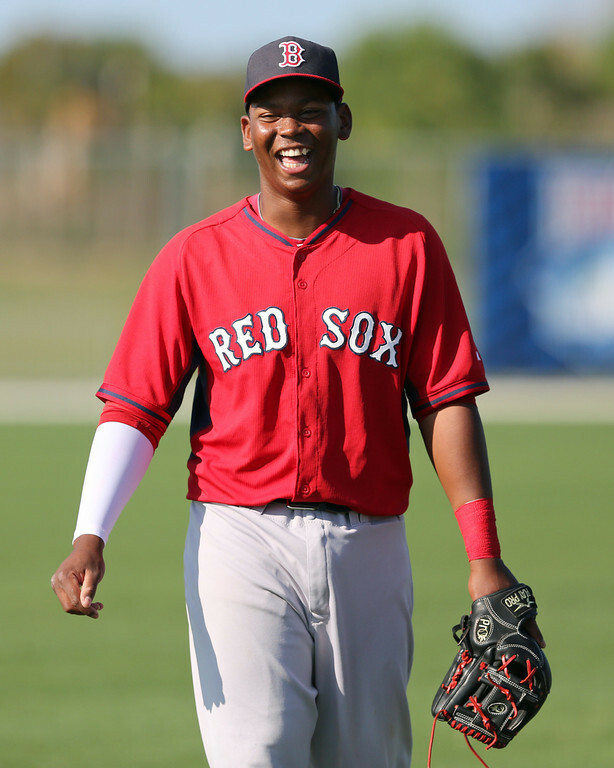 The list includes four players ranked inside SoxProspects.com's top 20: third baseman Rafael Devers (pictured), shortstop Javier Guerra, pitcher Michael Kopech, and infielder Mauricio Dubon. Catchers Jordan Procyshen and Ben Moore, outfielder Derek Miller and reliever Mario Alcantara will also be in the contingent. Four of the eight players – Procyshen, Devers, Guerra, and Miller – earned starting nods. Devers currently sits at No. 4 on the SoxProspects.com rankings, and has put together an impressive offensive campaign for the Drive. The 18-year-old Dominican has compiled a .321/.354/.455 slash line with three home runs, 14 doubles and 26 RBI, and ranks third in the league in average. Signed as an international free agent in July 2013, Devers is in his first season of Low-A ball after spending last season in the Gulf Coast League. Guerra has been excellent with the bat as well as one of Greenville's defensive stalwarts, posting a .294/.349/.494 slash line along with a team-high five home runs, 23 RBI and two triples. The 19-year-old Panamanian has shown improvement at the plate at every level so far in his minor league career, going from batting .248 with the DSL Red Sox in 2013 to .269 with the GCL Red Sox last season to nearly .300 this year. Kopech, a 2014 first-round pick, entered 2015 with high expectations and has more than held his own, boasting a 2-4 record with a 3.11 ERA an 1.22 WHIP in his first full minor league season. The 6-foot-3 right hander has also compiled 44 strikeouts in 37 2/3 innings pitched, and earned South Atlantic League Pitcher of the Week honors for the week of April 20-26. Dubon has showcased his bat and plus speed on the base paths this season, leading the team with 15 stolen bases along with a .294/.340/.421 slash line through 48 games. The 20-year-old Honduran has also hit four home runs and knocked in 26 runs while splitting time between shortstop and second base. SoxProspects.com Managing Editor Matt Huegel recently profiled Dubon and his journey from 26th-round pick to top-20 prospect. Procyshen, one of the South Atlantic League's most offensively-productive catchers, draws the start behind the plate after posting a .281/.363/.345 slash line in 39 games this season. The 22-year-old Northern Kentucky product also has six doubles and 21 RBI to his name thus far in 2015. Moore has performed well as the Drive's backup catcher, batting .319 in 24 games with a .356 on-base percentage. The 6-foot-1 backstop was drafted in the eighth round in 2014 after spending three seasons at the University of Alabama. He converted back to catcher in pro ball after spending most of his college career in the outfield. Miller has been a key contributor at the top of Greenville's order, with a .293/.388/.351 slash line in 50 games, leading the team in both RBI (29) and on-base percentage. Alcantara has been excellent out of the bullpen for the Drive, and owns a 1.53 ERA, 1.16 WHIP and 27 strikeouts in 29 1/3 innings pitched across 16 appearances. The 22-year-old Dominican also boasts three saves along with a perfect 2-0 record.